Stan Strickler reviews Corn Stock Theatre's production of "The Dixie Swim Club." Rarely do men get together to talk and socialize. Women however, can congregate, converse, and just be together. 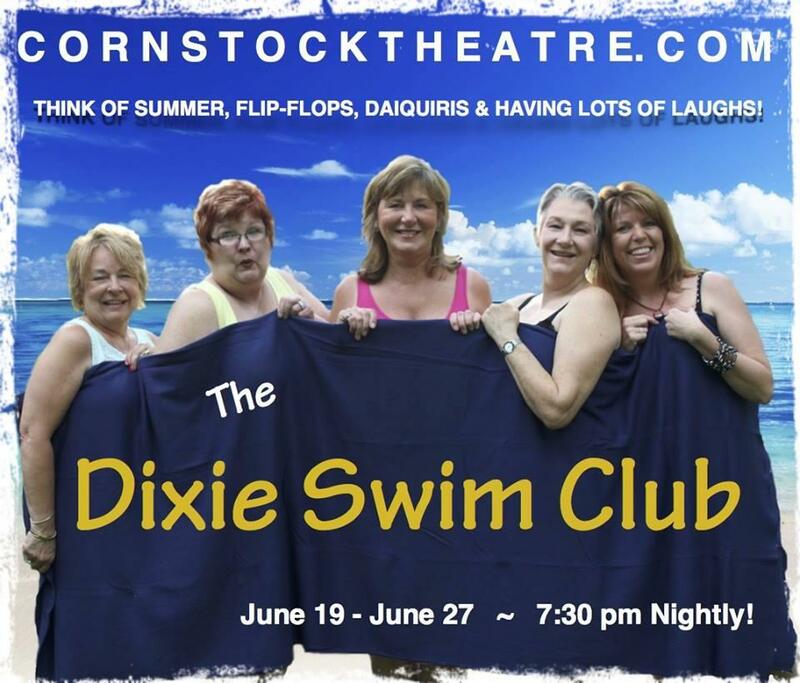 The Dixie Swim Club currently playing at Corn Stock Theater illustrates this concept, as five women congregate annually for their swim team reunion. They talk about problems with their husbands, raising children, and their ambitions. But mostly they just relate to each other, strengthening the bonds which brought them together. The play opens twenty-two years after the women graduated from college and traces them over the next thirty-three years. All of them were on a college swim team. Sheree was the captain, and is the planner of the group. The other members include Lexie who has been married so many times, that her friends almost forget how many; Dinah, the high powered attorney who has chosen to remain single; Vernadette who is married and has two very wayward children; and Jeri Neal who has become a nun. The first scene is filled with humor as the women discuss their lives, and ends in a surprise with the entrance of Jeri Neal. The second scene, five years later, traces the further travails and triumphs of these women, their families and careers. Act Two brings some unsettling news and a tender scene between Lexie and Dinah, and closes as a hurricane bears down on their vacation home. The last scene -- twenty-three years later -- shows the changes that time has brought to these women as they have lost one of their number. The cast is made up of five veteran actresses. Cheri Beever as Sheree is all business as she lays out the plans for the weekend. She is used to being in charge and doesn’t miss a beat in doing so. As Lexie, Trish Ballard is hilarious as the stereotypical Southern Belle, but she also shows a much appreciated understanding of what friendship means. Carol Rapp Urish as Dinah, the take-charge lawyer, also has a tender side as she changes over the course of the play. Barb Couri gives an over the top performance as Vernadette, the loud-mouth of the group who brings much of the humor to the play. Belinda Calvert as Jeri Neal ably shows us a caring person who is the peacemaker of the group. Lana Warner and Lisa Warner Jeans have wisely selected a cast to reveal a funny and touching story of friendship over the years. The set by Chris Franken beautifully depicts a seaside cottage on the outer banks of North Carolina. It is bathed in soft pastels. My only reservation about the set is that most of the action of the play occurs on the upper stage, removed from the audience. I think that with a play this intimate and funny, the action should occur close to the audience, making us more a part of the lives of the characters. All in all though, this was a truly enjoyable evening, and a perfect summer entertainment. It is by turns funny, heart-warming, and touching as the characters reveal more of themselves and show us what true enduring friendships look like. “The Dixie Swim Club” continues through Saturday, at Corn Stock Theatre. More information is available at www.cornstocktheatre.com.